The competition we faced back home always prompted us to cross-examine our children when they came home with a report card or a test result. We always wanted to know as to who got the maximum marks, where does our child stand in the class, etc. At the end of Grade 11 of Nikhil in June 20114, when our son came home with the report card, he declared “do not ask me how others did as I have no clue as I did not ask anyone about it”. It is indecent to ask someone their marks in Canada and the marks are confidential and is never announced in public. The report cards are handed over to the students in a sealed envelope, obviously to ensure confidentiality. The aim of a progress report in Canada is to enable the students to reach their potential, and to succeed. It is a real challenge for the school as every student is unique and they got to ensure each student gets adequate opportunities to achieve success according to his or her own interests, abilities, and goals. The reporting is fair, transparent, and equitable for all students. It supports all students, including those with special education needs and all those learning the language of instruction (English or French). The curriculum is carefully planned to relate to the expectations, learning goals and cater to the interests, learning styles and preferences, needs, and experiences of all students. All aspects of learning are communicated clearly to students and parents at the beginning of the school year and at other appropriate points throughout the school year or course. The reporting provides a descriptive feedback that is clear, specific, meaningful, and timely to support improved learning and achievement. It also develops students’ self-assessment skills to enable them to assess their own learning, set specific goals, and plan next steps for their learning. 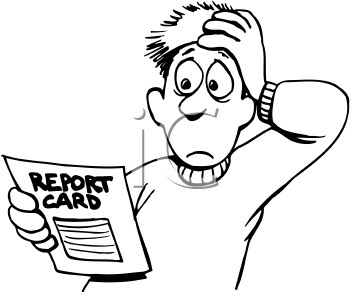 The high school report card looks more like the Annual Confidential Report (ACR) in the army – it appears as if it leaves no aspects of learning skills and work habit of the child uncovered. The aspects covered in the report are Responsibility, Organization, Independent Work, Collaboration, Initiative and Self-Regulation. Strengths and Steps for Improvement are listed out for each subject separately. My mind raced back to our Sainik School days and even our army course days; where no marks were ever kept confidential and were mostly put up on a notice board. I always looked at the mark list on the notice board to make sure that I was not the last. What an injustice, especially to those who did not fare well. 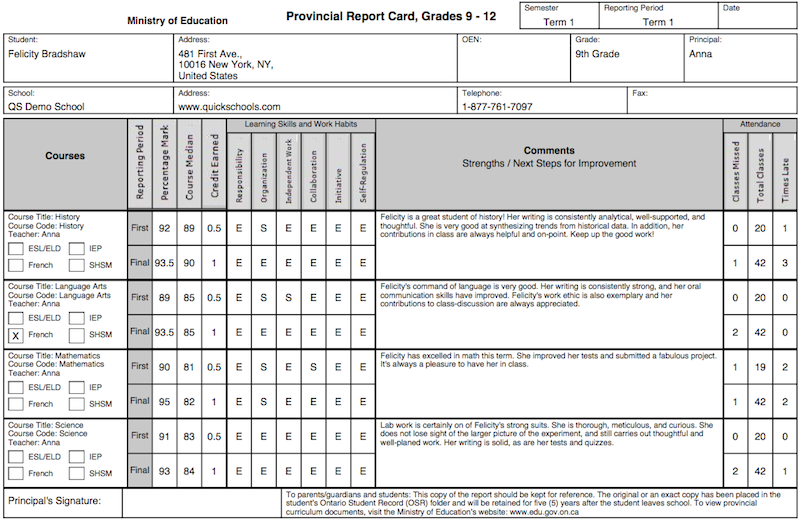 Once I perused his report card, I asked him a few questions to find out some details about the steps for improvement and we discussed in detail as to how he is going to prepare for his Grade 12. After discussing the same, I casually asked our son as to how his friends did. Our son theorised that students want to either show off their marks or feel a bit good when they have really done well or in case they haven’t, they are looking for someone who did worse. He was not in either and hence did not find out how others did. I realised that what he said was what I had been doing all throughout my life, either blow the trumpet, or look for someone who did worse to feel happy that you are not the worst. Our son had done exceptionally well in French and the teacher rewarded him with a recommendation for a cultural and educational exchange program in France. He went to Paris (01 July 2014) and returned on 31 Jul with a French Grade 11 Student, Guillaume Le Floch. Nikhil stayed with the Le Floch family for a month in France. Guillaume stayed with us and returned to France on 31 Aug. While Nikhil was away for a month, I felt a vacuum, both in my mind and at home. Our dog Maximus seemed pretty depressed and had been running all over the house looking for Nikhil. We will all got to get used to such absence of the kids and this will prepare us to learn to live without them in times to come. Good system. Personal attention covering all aspects of the student in over crowded schools in India is difficult but not impossible. Like you have said even exclusive institutions do not care about confidentiality. The total mind set has to change. Unfortunately Indian parents are much more interested to know how other students are studying rather than their own children. As a policy we never asked the kids what is their rank in the class or why they loose some marks. To my opinion class marks dont make any one successful in life. One of my cousin first rank holder from School board, IIT Madras, & XLRI Jamshedpur is wandering in Delhi for the last 30 years. Our daughter Beth consistently stood first in all English essay competitions by the KV southern Region ( South India) but got less than 60% marks for English in her CBSE exam. In nutshell if the kids are “Street Smart” they are fit to live in this world. The report card of a child is a matter of pride or a matter of worry for many families in India. On social occasions, ladies of middle class families are often seen boasting about the grades achieved by their children and also their future plans, which invariably includes studying or working in a developed country. Some schools post grades of all students in pdf format on the school web site for information of parents. Due to this, parents can compare grades of their children with that of other children. This increases the anxiety level of the child as he feels secure only till the time he obtains a good grade, or in some cases a better grade than the neighbor’s child. Pressurizing a child for better grades will stop only when parents realize that success in life is dependent on many factors; not only on exam grades. This reminds me of a scene in the Hindi movie, “Three Idiots”. Two of the three idiots are in the bottom of the list when their results are put up on the notice board after their first exams. They are feeling sorry for the their third friend, since they do not see his name near theirs, somewhere in the bottom of the list. Probably they have presumed that he has not even passed. But their misery is further enhanced when they learn that far from flunking or being close to them in that list, he is the topper. Since I am in one of the top ranking B-schools of the country where we have some of the brightest students of the country (the IIsM CAT exam is supposed to be one of the toughest Admission Tests in the world), I often get to hear various viewpoints on the grading systems. There is one school of thought as per which the toughness and highly competitive nature of the cream of the Indian students may be attributed to the Indian grading system. I am not too sure if this is really good. Because, a handful of the products of our system may become hot-shots and and high-fliers. But then the same system also creates many mental wrecks and people with low self-esteem. Reji, once again a very well-written article. I suppose that the western system of assessing school children is much more advanced, as is the case with their edn system itself. You seemed to have updated an earlier blog, is it not? good observation. Wishing Nikhil the very best in life! !